As the calendar turns to October, a wide-open race for the Big Sky Conference title has slightly more clarity. Yet a slew of scenarios remain with seven weeks of action remaining. A Montana schedule that does not include conference contests against fellow FCS playoff contenders Weber State and Eastern Washington all of a sudden looks like an advantage for the Griz. Meanwhile, Montana State has a crucial win over Western Illinois in its opener, two wins as the decided favorites and two games against nationally elite teams — No. 3 South Dakota State, No. 5 Eastern Washington — in which the Bobcats simply did not measure up. How will MSU navigate a pivotal stretch that includes hosting Idaho, playing at Weber State and at Idaho State to end October? 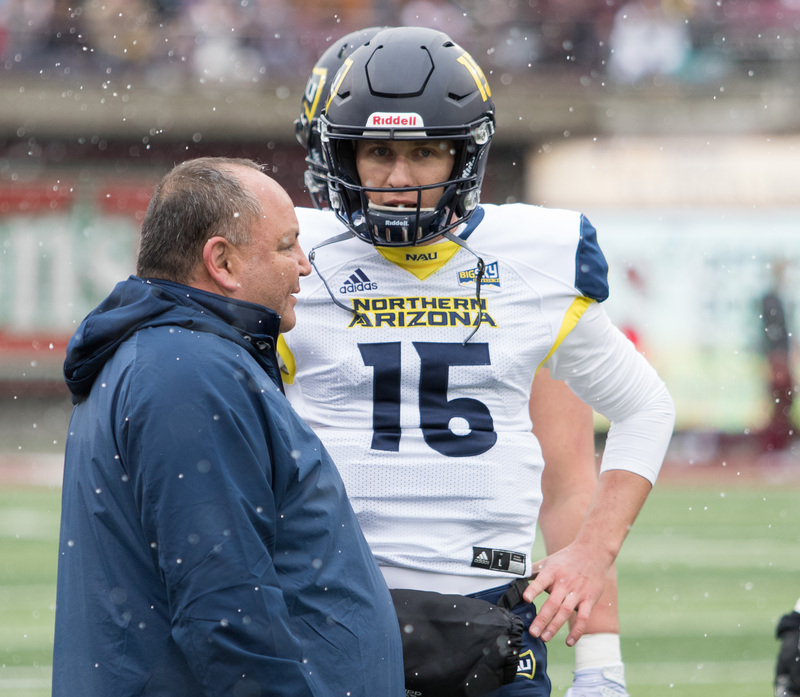 The indefinite absence of Northern Arizona All-American quarterback Case Cookus will continue to have an impact on the league, as will the unknown timetable for Northern Colorado senior quarterback Jacob Knipp’s return. Gage Gubrud’s consistent presence at EWU continues to keep the Eagles among the nationally elite. Is Idaho State for real? Will the Idaho Vandals rise as contenders or fold into pretenders? This week’s matchup between the in-state rivals in Pocatello marks the first showdown between Idaho’s state schools in more than two decades will be the next step in answering that question. Weber State appears to a front-runner to repeat as league champions despite losing a collection of talent, including three players currently playing in the NFL despite an offense that ranks at or near the bottom of the league in every offensive statistic. Southern Utah, the co-champion with WSU last season, has not won a game yet. The road doesn’t get any easier at Eastern Washington this week. But a Thunderbird team that has been to the playoffs three times since 2014 surely won’t go winless. Portland State, Cal Poly and Northern Colorado seem to be the three teams that might be overmatched throughout most of the season. But UC Davis is no longer a part of that group, instead asserting itself as a true postseason contender with this week’s No. 16 national ranking, the highest in the program’s history since moving to Division I.
Sacramento State remains an unknown commodity after a comeback win at UNC and a narrow 41-34 loss at Montana before taking a bye last week. SUU, WSU and Davis all were also idle last week. This week begins the first of eight editions of Skyline Sports’ Big Sky Conference power rankings. These rankings are based on strength of schedule, quality of wins and most recent performance. Included are our weekly picks from the previous and upcoming weeks. 1. 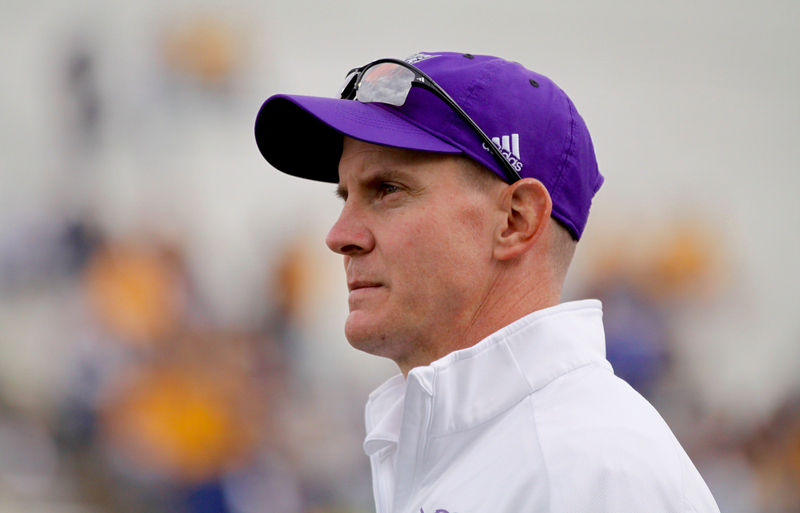 Weber State (1-0 in Big Sky play, 3-1 overall) — Evaluating Weber State’s body of work based on statistics produces a skewed analysis. The Wildcats jumped out to a 10-0 lead at Utah before being utterly shut down. The Wildcats gained 40 yards after gaining that lead, getting one first down the rest of the way. 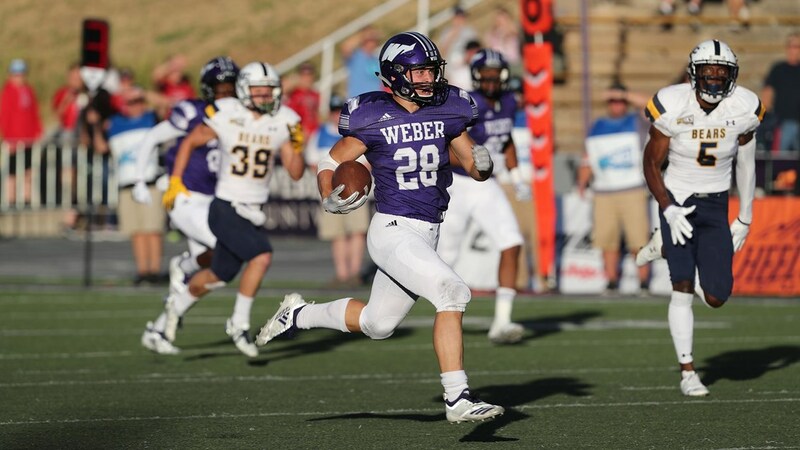 Since then, a ball control offense relying heavily on breakout redshirt freshman running back Josh Davis and a once again salty defense has led Weber to three straight wins. The WSU defense was particularly impressive in a 27-10 win over No. 22 South Dakota, a team that scored 43 on Northern Colorado the week prior. The Big Sky posted three wins in eight tries in its crossover challenge with the Missouri Valley Football Conference, the most impressive being Weber’s triumph over USD. The Wildcats can beat you despite the absence of an elite quarterback or offensive star. With seniors Treshawn Garrett and Kevin Smith on the shelf with injuries, Davis has shown the talent that helped him earn Utah Gatorade Player of the Year honors two years ago. In three starts, he has rushed for 499 yards and four touchdowns, averaging 6.2 yards per game and totaling 218 rushing yards last week against Northern Colorado. Even with stud senior safeties Jordan Preator and Jawain Harrison out against UNC, Weber proved the variety of ways the Wildcats can win. Rashid Shaheed took the opening kickoff of the second half to the house to break a 21-21 tie. Davis ripped off a 95-yard touchdown run to close the quarter to spark the 45-28 win. Special teams played a crucial role against South Dakota as well. All-American sophomore kicker Trey Tuttle drilled field goals of 43, 18, 39 and 26 yards to boost WSU past the Coyotes despite gaining just 250 total yards. 2. 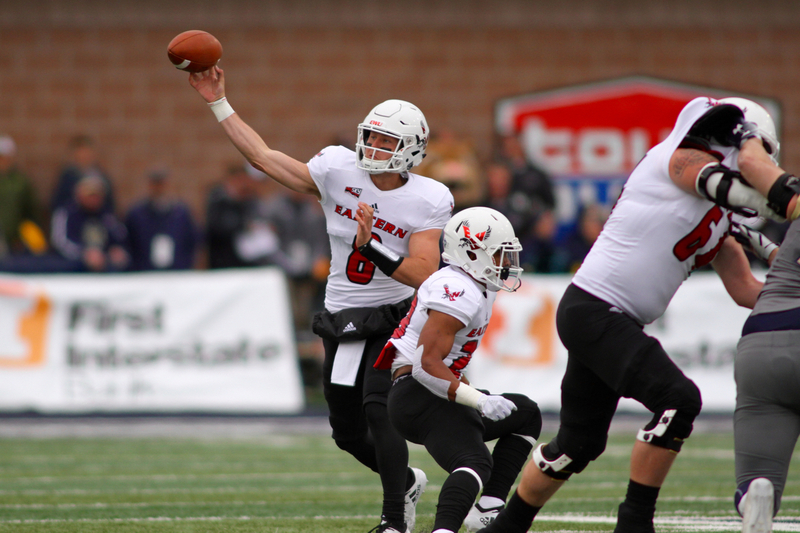 Eastern Washington (2-0 in Big Sky play, 4-1 overall) — If you have a quarterback, you have a chance. That was the train of thought entering the season as senior Gage Gubrud served as the primary reason the Eagles were the consensus pick by the Big Sky’s coaches and affiliated media to win the league despite missing the playoffs last season. Gubrud has been as advertised, throwing five touchdowns in a 58-13 win over Division II Central Washington; throwing for 322 yards and four touchdowns in a 31-26 win at Northern Arizona; guiding an offense that rushed for 441 yards in a 70-17 win over Cal Poly; and dissecting Montana State’s tough defense in a 34-17 win at Montana State last week. He enters October with a league-best 13 touchdown passes despite not throwing one last weekend in Bozeman. But Eastern has proved to be much more than a one-man show. Senior Sam McPherson’s 576 yards and five touchdowns on the ground each rank second in the league. Junior tailback Antoine Custer Jr. has struggled with a wrist injury, but when healthy has been his all-conference self, rushing for 133 yards and touchdowns of 62 and 43 yards against Cal Poly on just eight carries. Senior Nsimba Webster is averaging 101 yards per game, senior defensive tackle Jay-Tee Tiuli is one of the league’s most physically formidable interior linemen and Eastern Washington’s senior-laden offensive line is one of the league’s stoutest units. Having 28 senior on your roster is a serious boost for any team. When a variety of those seniors have banked experience and all-conference talent — safety Mitch Fettig, offensive tackles Tristen Taylor and Chris Schlichting, senior center Spencer Blackburn are all returning All-Big Sky performers — and you have a continuation of the talent advantage that has spurred EWU to five league titles this decade. 3. UC Davis (1-0 in Big Sky play, 3-1 overall) — Davis turned heads last season with an explosive offense led by Big Sky Offensive Player of the Year Keelan Doss. The 6-foot-3, 213-pound wide receiver led all of college football by averaging 10.5 catches and 130 yards per game. But the Aggies managed just three Big Sky wins and five victories overall. Narrow losses to Eastern Washington (41-38) at home and at rival Sac State (52-47) in the Causeway Classic proved to be the difference in keeping Davis from its first winning season as a Division I member. In the second season under Dan Hawkins, Davis is well on its way to securing a reputation as a playoff contender.The Aggies got off to a great start, posting a 44-38 win over FBS San Jose State as junior Jake Maier, the league’s Newcomer of the Year last season, threw for 364 of his 446 yards before halftime. The following week, Davis dismantled a San Diego team that has eliminated a Big Sky team from the playoffs each of the last two seasons, 54-21. The Aggies made a statement with a 44-21 win over Idaho, a team that has spent the last 22 seasons in the FBS before rejoining the Big Sky. Maier threw three touchdowns and UCD rushed for 256 yards, including 119 and a touchdown from sophomore Tehran Thomas. The emergence of Thomas and redshirt freshman Ulonzo Gilliam (132 yards & 2 TDs against SJSU, 3 TDs against San Diego) gives the Aggies a viable run game to pair with one of the best passing offenses in the country. The Aggies have winnable road games at Northern Colorado and at Cal Poly sandwiched around an October 13 home date against upstart Idaho State. If the Aggies can win two of three or all three, that sets up a Top 25 showdown against Montana that could prove to be a deciding result for one of the Big Sky’s playoff spots in the 24-team postseason tournament. 4. 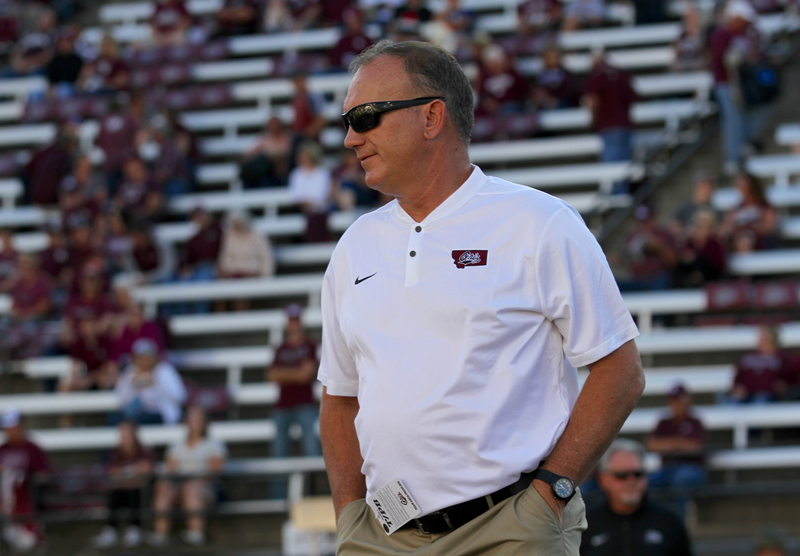 Montana (2-0 in Big Sky play, 4-1 overall) — On one hand, a 4-1 start to the season in Hauck’s second tenure leading his alma mater is a worthy accomplishment even if Montana has been the measure of success in the league for more than 20 years. On the other hand, Montana’s 26-23 upset of No. 13 Northern Iowa to usher in Hauck’s second stint resoundingly remains Montana’s only win in which the Griz entered the game as a predicted underdog. 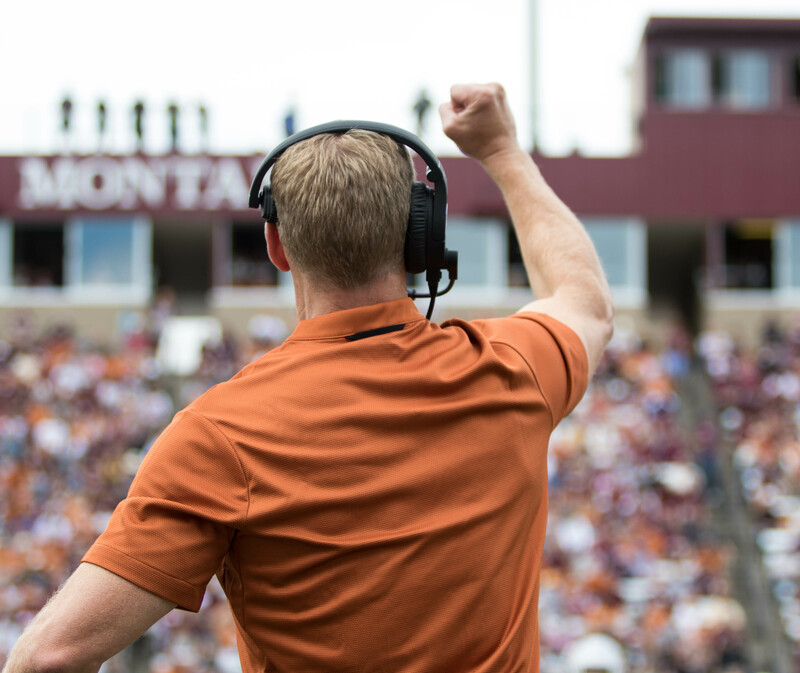 Hauck has quickly shown that Montana had issues stemming from discipline, defensive alignment, resiliency, and expectation much more than talent deficiencies. The creative and ever-evolving schemes of offensive coordinator Timm Rosenbach and defensive coordinator Kent Baer have helped players like quarterback Dalton Sneed and linebacker Dante Olson carve out early candidacies for the league’s MVP awards. The standout play of those two combined with the continually improving health of senior All-American linebacker Josh Buss, the continued progression of cornerbacks Justin Calhoun and Dareon Nash along with UM’s green offensive line and the continued production from the safety trio of senior Reid Miller, junior Josh Sandry and redshirt freshman Robby Hauck will only help Montana. UM’s consistent effort, impassioned play and ability to fight from opening whistle to final buzzer has helped the Griz enter October atop the league standings. Montana’s win over Drake was expected, its loss at Western Illinois more a matter of mistakes and missed opportunities than poor play and its win over an improved Sac State team an underrated victory. Montana smacked a Cal Poly team coming off the lopsided loss at Eastern Washington. The Griz have another game they are expected to win with Portland State visiting Missoula for homecoming Saturday. If the Griz can get that one, a 2-2 split during a stretch run that includes games at North Dakota, home against Davis (October 27), at Southern Utah and at Idaho seems feasible. That would give the Griz seven wins entering Cat-Griz, setting the table for Montana to break its two-year drought from the postseason, it’s longest since the early 1990s. 5. Idaho State (2-0 in Big Sky play, 3-1 overall) — Mike Ferriter, former Montana All-Big Sky wide receiver and UM’s wide receivers coach the last three seasons, has put a recognizable stamp on ISU’s offense in his first season as the coordinator. In his fourth year as Idaho State’s starting quarterback, senior Tanner Gueller looks efficient and steady. But it’s the physicality the Bengals have shown running between the tackles that has turned heads around the Big Sky. Behind the two-headed All-Big Sky backfield monster of James Madison and Ty Flanagan, ISU is rushing for 240 yards a game, including 294 per contest on the way to a 2-0 start in conference play. Idaho State posted its first win over a ranked FCS opponent since 2015 behind 273 yards rushing in a 25-22 win at No. 22 North Dakota. UND beat No. 5 Sam Houston State 24-23 the week before. 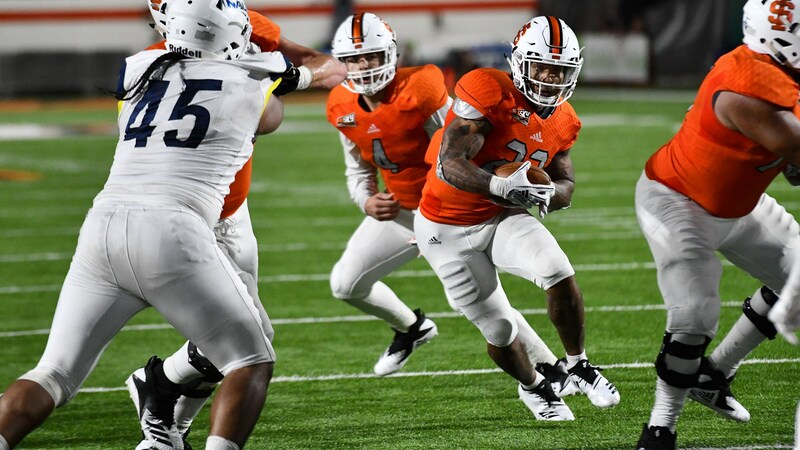 Last week, Madison rushed for 143 yards and two touchdowns to earn Big Sky Offensive Player of the Week as part of a 351-yard effort on the ground in Idaho State’s 56-42 win over Northern Arizona. Boise State left the Big Sky in 1996, rising to national prominence a decade later under Hawkins, then Chris Petersen. The Vandals chased the Broncos, leaving that same year, relegating ISU to second-rate status in the eyes of many despite Idaho’s consistent struggles in two decades in the FBS. On Saturday, Idaho State is projecting the first sellout of Holt Arena since 1984 as the Vandals visit Pocatello. It’s hard to imagine a scenario in which Idaho State could earn more affirmation of their improvements than beating the Vandals in the first battle between Gem State rivals in more than 20 years. 6. 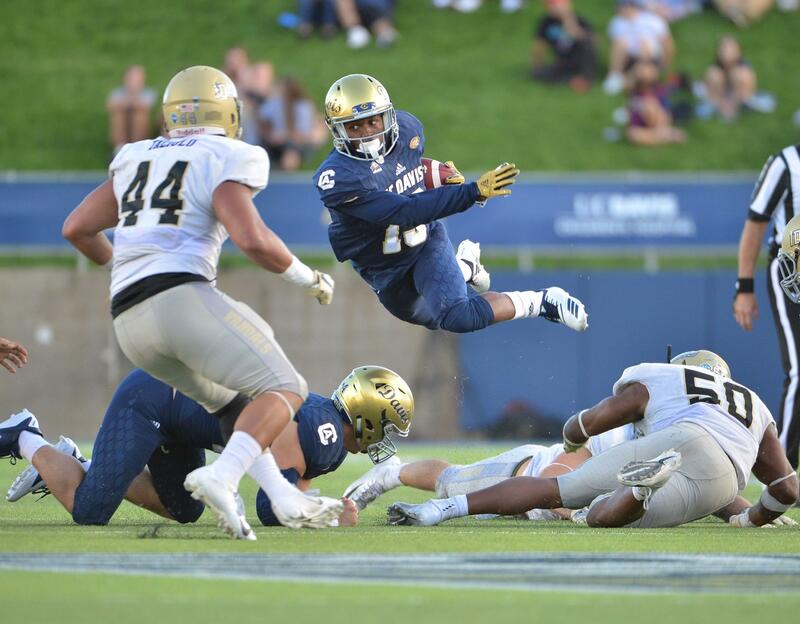 Montana State (1-1 in Big Sky play, 3-2 overall) — The athletic improvements Jeff Choate touted during the off-season entering his third season at the helm have shown since fall camp in August. The Bobcat secondary is more competitive physically, mentally and in terms of experience, particularly cornerbacks Tyrel Thomas and Jalen Cole. Junior Brayden Konkol is back playing his natural position at strong safety. 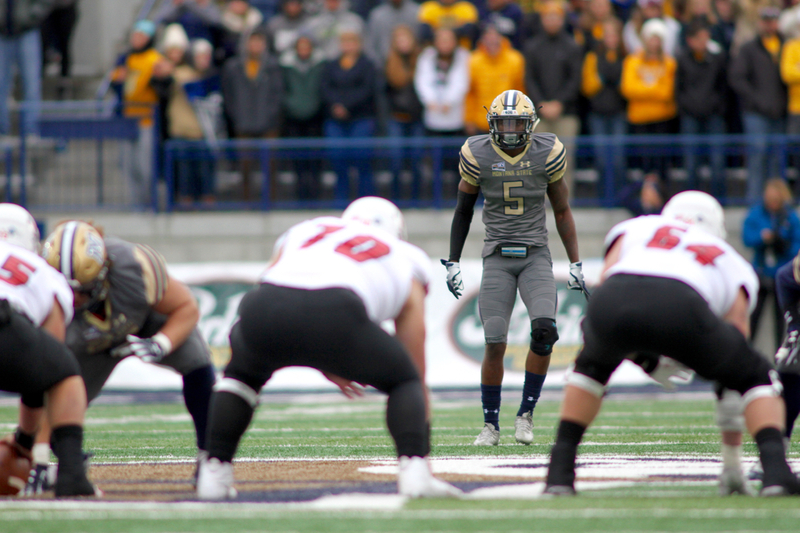 Virginia Tech transfer Jahque Alleyne gives Montana State a next level athlete playing next to Konkol. Bryce Sterk brings a similar element of physical fortification to MSU’s defensive line. The Washington transfer leads the league in sacks (5.0) and tackles for loss (8.5). 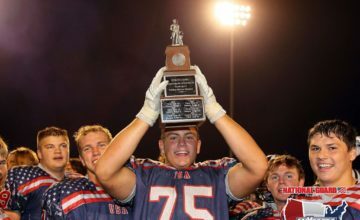 He’s been a fierce addition to a group that already featured explosive strong end Tyrone Fa’anono, savvy defensive tackle and captain Zach Wright, stout and tough nose tackle Tucker Yates and steady Derek Marks, the only junior among the group of otherwise third-year starting seniors. The offensive line features only one senior in center Alex Neale but a physical and talented group that is quickly becoming one of the league’s best. But Montana State has real issues at linebacker because of the potential season-ending back injury suffered by junior inside ‘backer Josh Hill, the continued quest for health for senior inside linebacker Grant Collins, the nagging knee injury currently slowing sophomore Chad Kanow and the youth of Michael Jobman and Jacob Hadley. And Montana State’s best linebacker might currently be playing quarterback. Troy Andersen willed Montana State to it’s season-opening win over Western Illinois with most of his 145 rushing yards and both of his rushing touchdowns after halftime. But he suffered a broken hand that cost him his spot under center in the loss at SDSU and MSU’s win over Wagner. Andersen returned at quarterback and rushed for the second-most yards (211) in league history to lead the Bobcats to a 43-23 win over Portland State. Last week, Andersen played both ways, spying Gubrud defensively on third downs in addition to his quarterback duties. He threw for 156 yards and ran for 94 more while notching two tackles and a stop of Gubrud on the goal line to force an EWU field goal. As talented as Andersen is, the plan to play him at quarterback seems unsustainable. If MSU goes with the sophomore down the stretch, offensive coordinator Brian Armstrong and quarterbacks coach/passing game coordinator Bob Cole will have to find a way to scheme more involvement for the rest of MSU’s offensive skill players. Meanwhile, an offense that can control the ball more effectively by converting third downs combined with the continued healing of MSU’s linebackers during the Bobcats’ bye week this week will help the defense continue improving in its quest to become elite. 7. Northern Arizona (1-1 in Big Sky play, 2-3 overall) — Daniel Bridge-Gadd is arguably one of the most talented backup quarterbacks in the Big Sky. The former Washington transfer was the 2015 Arizona Gatorade Player of the Year as a high school senior. And he’s been good since throwing three interceptions in his first start, a 40-8 loss at Missouri State. Bridge-Gadd threw for 295 yards and three touchdowns in NAU’s 31-23 win over Southern Utah. He threw for 313 yards and two scores last week in the loss to Idaho State. But he’s had a hard time protecting the ball, including committing two crucial fumbles that thwarted NAU’s attempt to rally in a game the Lumberjacks trailed 35-14 at halftime. More than the turnovers, Bridge-Gadd is not Cookus. And that’s a disaster for NAU. Of all the offensive stars in the Big Sky, Cookus is the most essential to his team’s offensive system and offensive success. Gubrud is the savvy field general but basically every EWU quarterback the last 20 years has produced at a nationally elite level. Maier throws as pretty a deep ball as one might see in FCS football. But throwing it up to the best NFL prospect in the league in Doss is a rare advantage. 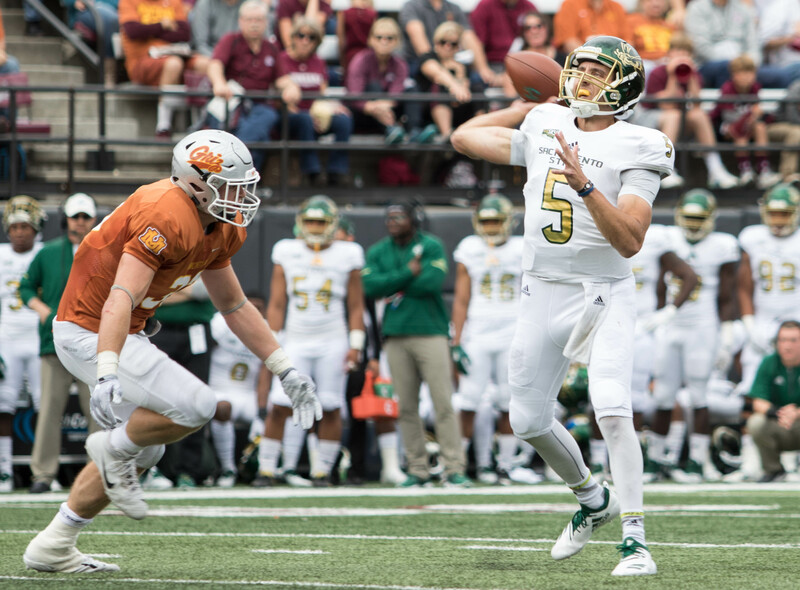 Cookus is the field general, the league’s reigning first-team All-Big Sky quarterback and one of the most accurate quarterbacks on the West Coast. NAU nearly made the playoffs during a freshman season in which Cookus threw 35 touchdowns and just three picks on the way to winning the Jerry Rice Award as the FCS’ top freshman. In 2016, NAU finished 5-6 because Cookus broke his collarbone before league play began. 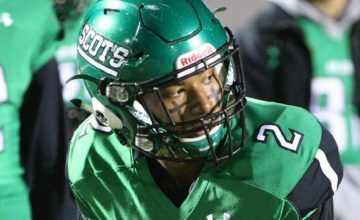 Last season, Cookus led the Lumberjacks to the playoffs for the fifth time in Jerome Souers’ 21 years at the helm. In the first half of NAU’s 32-26 loss to Eastern Washington, Cookus suffered what looked like a similar injury to the one that ended his second season at NAU. 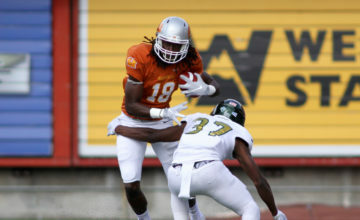 Despite one of the league’s most physically gifted players in senior wide receiver Emmanuel Butler, a running game featuring talented backs like Joe Logan and Corey Young and a defense featuring a savvy secondary led by All-Big Sky safeties Wes Sutton and Kam’Ron Johnson, Northern Arizona is going to struggle if Cookus does not return to the lineup this season. 8. Idaho (1-1 in Big Sky play, 2-2 overall) — Some thought the Vandals might return to the league and wreck the competition because of the potential superiority in talent after more than two decades of FBS existence. Others wondered if motivation would be an issue for a group of players that went to Idaho to compete in bowls, won nine games and including the Famous Idaho Potato Bowl during the 2016 season and now spearhead the only “move down” in the history of Division I college football. Even with a four-game sample size, it remains unknown which narrative the Vandals are mimicking. One of the most surprising results of Week 1 came when UI was on the wrong end of a 79-13 beatdown at Fresno State. The second half, Idaho struggled for a half before cruising to a 56-10 win over Division II Western New Mexico. Idaho’s first FCS game came in its first conference game at UC Davis. The Aggies shredded the Vandals. Last week, UI lured an inexperienced Portland State team into a slugfest, then out-muscled the Vikings while pitching a shutout in a scoreless second half of a 20-7 win. The performance in Pocatello this week could prove telling to Idaho’s prospects for the rest of the season with either a win or a loss. 9. Sac State (0-1 in Big Sky play, 2-2 overall) — Much like Idaho, and to a certain extent Southern Utah, Sac State remains an unknown. The Hornets destroyed an NAIA school in Saint Francis (Illinois) in a 55-7 season-opening victory. Sac led San Diego State 14-13 in the fourth quarter before losing 28-14. The Hornets’ fourth quarter rally at Northern Colorado in a non-conference game between Big Sky foes would look more impressive if not for UNC’s 0-5 record. And Sac State showed no fear, particularly in building a 28-17 first halft lead, in an eventual 41-34 loss at Montana. Sacramento State surprised the league last season by winning six conference games and seven games overall. A bulk of that roster returns in tact, including senior quarterback Kevin Thomson, senior defensive end George Obinna, senior safety Mister Harriel, senior middle linebacker Manoah Pearson, senior wide receivers Jaelin Ratliff and Andre Lindsey and senior cornerback Dre Terrell. But Obinna, a first-team All-Big Sky selection after ranking second in the league with 8.5 sacks as a junior, has been slowed by a shoulder injury. He did not play against Montana, nor did Terrell or junior All-Big Sky defensive tackle Dariyn Choates. Elijah Dotson has emerged as a home run threat — he rushed for 234 yards against Montana — but the Hornets still need to prove that least season’s breakout was not just a fluke with a soft schedule playing a factor. Sac lost to Weber State in the non-conference while losing its league games at Eastern Washington and to NAU. But Sac doubled up BSC co-champion Southern Utah 54-27, the lone league loss for the T-Birds last season. This year, Sac misses Montana State for the second straight season, miss Eastern Washington and don’t play either Idaho school. But the final seven games of league play does bring match ups against against Southern Utah, North Dakota, NAU, Weber State and rival UC Davis to end the season in the Causeway Classic. 10. Southern Utah (0-1 in Big Sky play, 0-4 overall) — Southern Utah is the best of the winless teams, but that’s no solace for a team that shared the league title in 2015 and last season while also making the 2014 playoffs and finishing with a winning record the one season in between. The offensive production has been there, especially in the run game. The Thunderbirds are rushing for nearly 200 yards per game behind an offensive line featuring three preseason All-Big Sky players and the one-two punch of senior James Felilia and junior Jay Green. Following an upset 34-30 loss to North Alabama, a team in the middle of a transition from Division II to Division I, SUU got hammered by a pair of Pac 12 opponents. Delving into statistics is pointless when a 48-25 loss at Oregon State and a 62-31 loss at Arizona are part of the equation. SUU usually plays natural rival Northern Arizona in the final game of the season. Instead, former four-star quarterback Aaron Zwahlen threw a go-ahead touchdown with three minutes to play in the third quarter in Flagstaff in the Big Sky opener for both teams. But a pair of TD passes from Bridge-Gadd in the final 17 minutes lifted NAU to a its first FCS win, 31-23. 11 Cal Poly (0-2 in Big Sky play, 1-3 overall) — The Mustangs are the only team in the bottom four with a Division I victory. It came 44-15 over Brown, an Ivy League team that qualifies as an FCS opponent despite lacking comparable talent to other teams in the Big Sky. Senior fullback Joe Protheroe leads the league in rushing (660 yards) and rushing touchdowns (seven) on an astounding 148 carries. But teams have reverted to defending Poly’s triple option by eliminating explosive runs, letting the Mustangs run a string of plays and forcing Cal Poly to make mistakes. If Cal Poly can’t hang on to the football, the struggles following a 1-10 season in 2017 will continue. 12 Portland State (0-2 in Big Sky play, 1-4 overall) — Portland State snapped its 15-game losing streak with a 63-14 win over the College of Idaho, an NAIA team that competes in the Frontier Conference with small schools like Montana Western and Carroll College. The rest of the slate has included beatdowns at the hands of Nevada (72-19) and Oregon (62-14). In league play, Portland State gave up a variety of long runs to MSU’s Andersen on a day in which the converted running back rushed for the second-most yards by a quarterback (211) in Big Sky history. Last week, PSU engaged in a slugfest with Idaho and could not muster enough counters, falling behind 20-0 at halftime in a 20-7 loss. All-American tight end Charlie Taumoepeau has been a bright spot with 15 catches for 420 yards and five touchdowns, including five catches for 125 yards and two scores against the Ducks. 13 Northern Colorado (0-2 in Big Sky play, 0-5 overall) — Northern Colorado entered the season with higher expectations than several of the teams ranked ahead of the Bears in these rankings. UNC almost rallied for a win in a 17-14 home loss to No. 17 McNeese State. The following week, Knipp threw for 331 yards and three touchdowns but the Bears could not corral South Dakota dual-threat Austin Simmons. He threw for 462 yards and four touchdowns and rushed for 80 yards and a score in USD’s 43-28 win. Knipp went down with the same upper body injury that has ended each of the last two years as UNC blew a fourth-quarter lead in a 28-25 non-conference loss to Sac State. From there, the offense hasn’t been able to stay on the field and the defense has continued struggling, completely changing the arc of Northern Colorado’s season. Photos by Brooks Nuanez and attributed. All Rights Reserved.